While the LOFAR UK608 station in Chilbolton continues to work as a single station and with the rest of the LOFAR array at almost full strength, it did suffer some damage in the storms which passed through Hampshire in early January. Most of the damage appears to have been caused not directly by the storm, but by debris from the first HBA which broke blowing around the LBA field. Whatever the cause, some repairs are needed, and some improvements will be made to try to ensure this doesn't happen again. The necessary spare parts arrived from the Netherlands recently, and tomorrow the "army" of postgrad students, researchers (and even the odd Professor) from local LOFAR-UK universities will be remobilizing to help with the repairs. We're all looking forward to the kind of fun we had during the original installation week in June 2010, although perhaps with slightly more warm clothes on! Stay tuned for some pictures and updates. 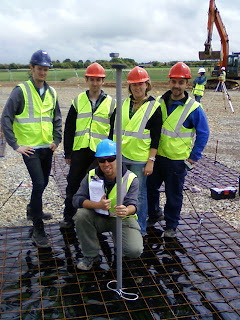 A team of scientists more used to dealing with computer code than spanners put together an antenna in June 2010.